A year or two ago Roy Underhill had an episode where he looked closely at the contents of a Viking Toolbox replica. 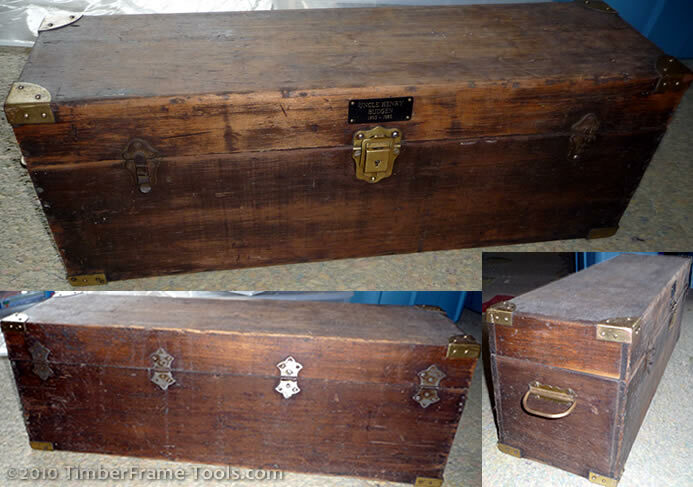 The actual toolbox was uncovered by a farmer back in 1930. It was an interesting look. I recently undertook a look at a bit of family history. My Great Uncle (Henry Budgen 1893-1985) was a carpenter by trade. Late in his life, he passed his toolbox on to my dad, who then passed it on to my nephew, who bears the same name. Nobody in our family seemed to know what kind of carpenter he was, so I decided to take a look through the tool chest. Ahh if only these tools could talk. 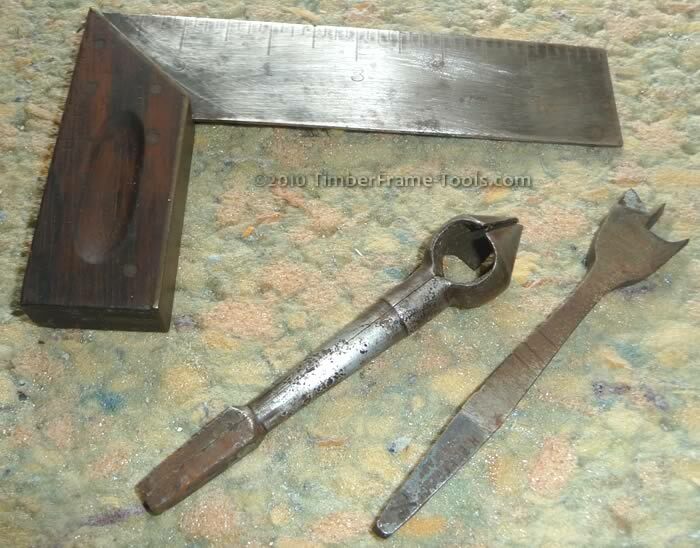 I estimate that most of the tools are from the 1930’s. Some tools were not surprising, some were cool, and some were puzzling. Lets take a peek inside the time capsule. Fortunately there was a nice little 6″ Tri-square that I used to set the scale in a bunch of the photos I took. This chamfering bit was interesting. It actually splits into two halves for sharpening. The 7/8" spur bit is also nice. This hand made jig was interesting. It consisted of a file held square into a slot in a piece of wood and held in by a small panhead screw. 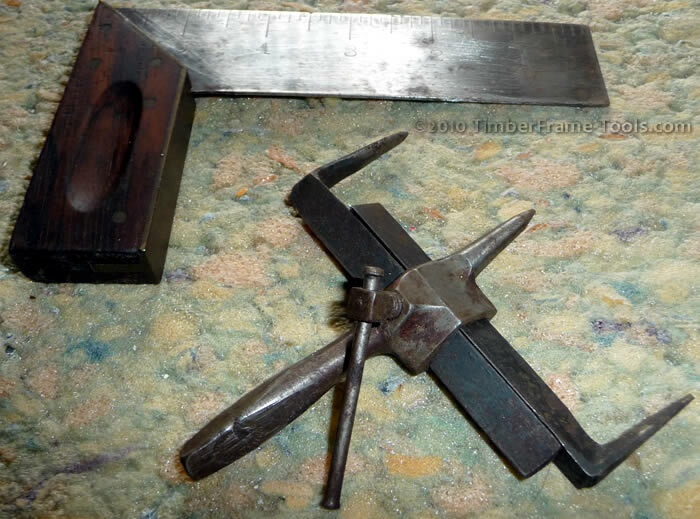 I recognized it immediately as a file jointer used to joint the edge of either a card scraper or joint the teeth on a saw during sharpening. The file in this hand made jointer is rusted heavily but only near the screw that holds it in place (dissimilar metals). Presumably he sharpened his own saws. It was hard to tell though because other than the coping saw, there were no saws in the toolbox. The saw nest in the lid was empty (but I swear I remember a pair of saws being in there when I opened it as a child…. hmm where’d they go?) Oddly enough, there were no triangular saw files. There were also no chisels, so I am guessing that this carpenter’s toolbox is incomplete. Sharpening was an important and properly represented piece in this toolbox. 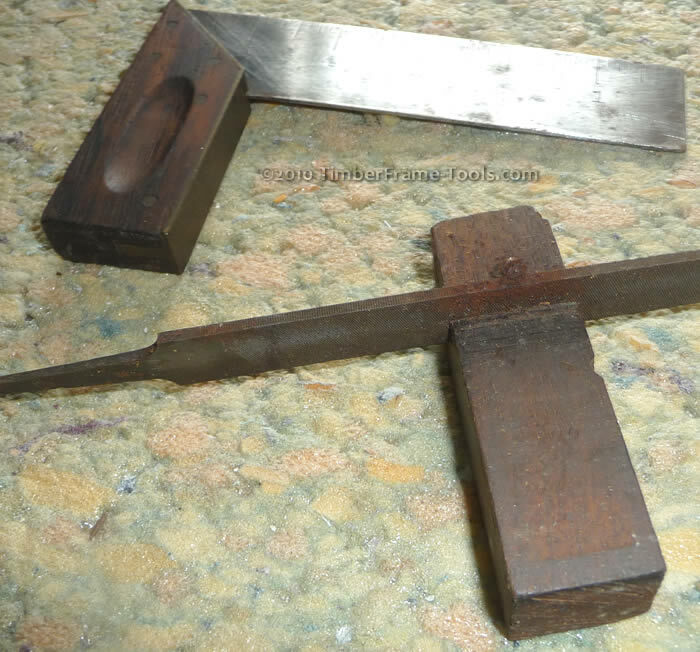 There was a nice little brass roller-ball guide for sharpening plane irons and possibly even chisels. At first I thought it was odd that there was no square face to help register the blade in it squarely. However, after thinking about it a bit, I realized that since it is a roller BALL and not a wheel, and the mount for the chisel is a single pad, it doesn’t matter whether the guide is square to the blade. Given only one point of contact from the ball, all that matters is the distance from the ball to the edge of the blade. Square takes care of itself. If the iron was originally square, it stays square, if it was originally skewed, it stays skewed. I like it. Clever brass sharpening rollerball guide for planes and possibly chisels. The toolbox also contained an oil stone and a leather strop for sharpening. 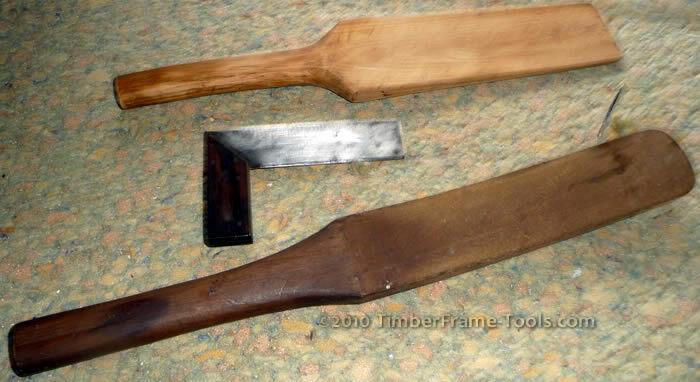 The strop was in good condition, but the stone was significantly dished. Makes me wonder what he was sharpening that dished the stones in this manner. It certainly was not the three plane irons in the toolbox. They were pretty sharp, but not the right shape to create the wear spots on the stone. The absence of chisels and saws was not the only mystery in the toolbox. These paddles and their purpose are something I have not figured out yet. They are smooth and the handles feel like they got a lot of use. Use as what, I am just not sure. They show no signs of impact or heavy wear, so I am don’t think they were used to hit or pry anything. They are a mystery. They look like they should be used to stir something, but they show no signs of doing that task. What are they?? I found this ruler that at first glance I thought was an old folding ruler. Instead I was surprised to find that instead of each segment flipping or folding out, each segment slid out on grooves. It was a sliding rule. Unfortunately only one of the two photos I took came out so some of the detail is missing. It is an Interlox 106 sliding ruler. Very clever in design. Each segment locks in place as it slides out. To slide it all back down, a release on each segment has to be pressed. This is probably what lead to the reason it wasn’t popular. It was easy to get the rule out to length, but it was a pain to put it away. I’ve seen a few on eBay, but often they expire with no bids being made. Not a popular design I guess. Slick design for extending to length, but annoying to put away. I also found this circle cutter that is intended to be used in a brace. It has adjustable arms with nickers on them. Each arm can be adjusted individually to cut two concentric circles. The center point has no cutting edge on it so it is not intended to bore. 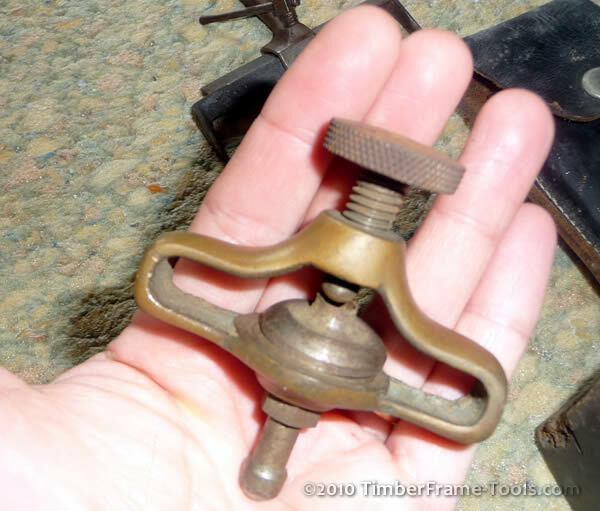 I have only found a few references on eBay and some identify it as a leather washer cutter. That would make sense for the cutters since they don’t seem to be intended to cut wood other than to score it. I don’t understand though what the need would have been to make leather washers of no less than 3 1/2 inches up to 6 inches in diameter. I’ll have to research that some more. My theory on the tools that seem to be missing (chisels, saws, hammers, clamps …) is either that he decided to hang onto them so they got separated from this toolbox, or he sold them, or passed them on to another wood worker, or my father used a few of them and so they mingled into his collection … in which case they are likely now in my collection. The only thing I am truly missing is his recipe for chocolate cake. When he was much older and would come to our house for holidays or birthdays, he always brought a homemade chocolate cake. I can still feel the texture of the cake carrier he used and taste the heavy sweet chocolate icing. For someone that earned his living as a tradesman, he was a heck of a baker. As for what kind of carpenter he was… my guess is that he was a finish carpenter, but given what seems to be missing, it is hard to say. After a bit of discussion on a Lumberjocks post it has been reasoned out that the wooden paddles were likely wedges used for leveling a door while hanging it. Very interesting. I have a lot of old tools that belonged to various members of my ancestry. My favorites are several old Stanley planes that belonged to my great uncle who was a builder and cabinet maker. Doc, That’s great. There is something about using tools that belonged to family. I can’t put my finger on why, maybe they are just romantic notions, but I enjoy it. I have a similar good fortune. The rather large carpenter’s box contains everything needed but the raw materials to build a fine house. It belonged to a member of my wife’s family in Hyde Park (now part of Boston), MA. There is a separate box just for braces and bits. Included are brass tape measures, specialty planes and even a tool for making old wooden gutters. There is even a laddle and lead bars for sealing cast iron plumbing. Like yours it is a real time capsule. Some tools are unknown to me and some are obviously home made for some specialized purpose. 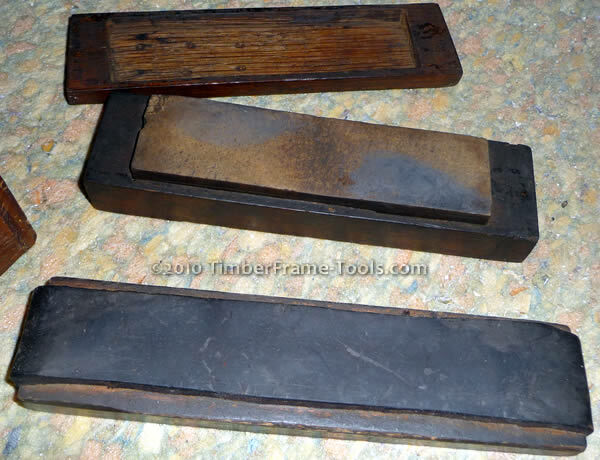 I have used the wooden planes and found thme to be both very sharp and efficient. 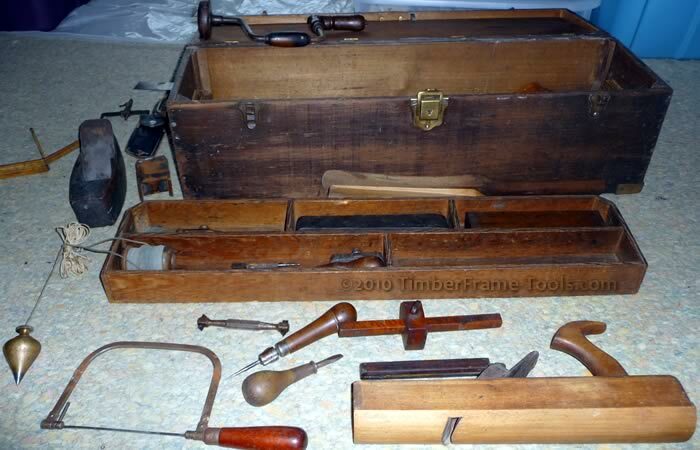 My late father-in-law told me that when these tools were in service, carpenters came to work in coat and tie. They arrive an hour early sharpen and service their tools before the day’s work began. While I have considered displaying them on the wall of my home shop, I enjoy keeping them in their origional chest to examine every year or two. Its like being a young boy on Christmas morning all over again! I think there are a lot of these old carpenters chests around. Unfortunately I think there are fewer family members that appreciate having the these great memories taking up space in their homes. Glad to hear you appreciate having them. Thanks Geoff. I think you are right that they are for cutting leather washers. Apparently these would have been needed by finish carpenters for heat runs.